Lucille Clifton. Mercy. Rochester, New York: BOA Editions, LTD, 2004. 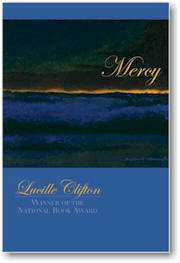 Solemn and sympathetic, Lucille Clifton’s Mercy includes reflections on the terrorist attacks of 9/11, painful remembrances of childhood molestation, and thoughts on spirituality. Although some poems in the volume reflect or inspire anger, such as the terror inflicted by a father who sexually abuses his helpless daughter or son, it overwhelmingly conveys a sense of compassion and understanding. Through these poems, Clifton offers mercy to those in pain and opens the eyes of the reader to victims behind closed doors or in other countries. In the poem “a story: for edgar,” the speaker is an adult who is reflecting on her father’s abuse and commiserating with a friend who also suffered in his own childhood. Clifton brings to our attention the painful paradox of the abused child who is terrorized and broken by the one in her life who is supposed to be “guarding the bedroom door / watching out for prowling / strangers for beasts and ogres / like in the childrens tale.” Instead, the father of the speaker is remembered “moaning a lullaby / in a wolfs voice.” This portrayal of father as wolf, a predator, rather than a guard or protector, reveals the nightmare of sexual abuse which haunts the speaker and her friend who later “…began this storytelling life / … / wondering how did we survive / to live not happily perhaps but / ever after.” Thus, the speaker and her friend survive but can never be truly whole or happy because of their experiences of abuse. “Tuesday 9/11/01” begins a series of reflections on the terrorist attacks that destroyed the Twin Towers in New York City, and killed American civilians, leaving a hole in the island of Manhattan and in the heart of the nation. Clifton cuts to the core of the national response, portraying the realization that “they know this storm in otherwheres / Israel Ireland Palestine” but “.. no one is exempt / the world is one all fear.” Terrorism was known to exist in other countries, but we never thought that it could happen on our soil. 9/11/01 changed that, and united us with other peoples who have been attacked and suffered loss, grief, and fear. This painful realization paves the way for empathy and mercy toward people from other countries, teaching or reminding the reader that we are one in our suffering.